Results: Sensitive, yet tough. That's nanoDESI. 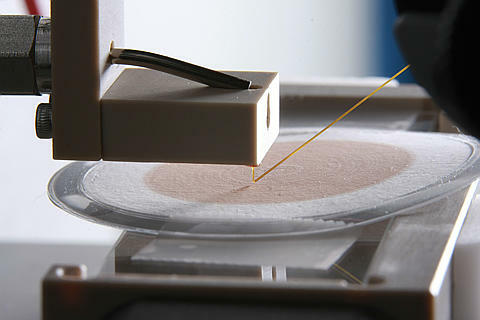 The Nanospray Desorption ElectroSpray Ionization technique, a novel method created at Pacific Northwest National Laboratory to analyze tiny samples of atmospheric aerosols. This new technique requires no sample preparation and provides a reliable, simple way to introduce these samples into a mass spectrometer for detailed analysis of their molecular content. With NanoDESI, scientists are breaking the sensitivity limits of conventional approaches. Why it matters: Combustion engines, forest fires, and countless other sources emit chemically complex organic aerosols that have diverse impacts on atmospheric chemistry and human health. Traditional molecular-level analyses of these troublesome aerosols use an array of analytical techniques and require expert technicians and significant sample preparation. However, nanoDESI can help precisely describe the molecular makeup of the aerosols using minute samples with no sample preparation. "NanoDESI reduces the amount of material required for analysis, the time involved, and hence the cost of obtaining data," said Dr. Patrick Roach, a physical chemist at PNNL who invented the nanoDESI approach. "Information from this technique provides insights that could help mitigate the impact of aerosols." Methods: The researchers begin with a sample of aerosol particles deposited on a substrate in laboratory and the field studies. They place this sample into the nanoDESI apparatus in the Department of Energy's EMSL. Using two small glass tubes or capillaries in series, a continuous stream of solvent is brought in contact with the surface of the sample. This solvent can be almost anything the scientists want, such as a mixture of water and methanol. When the solvent touches the sample, the material on the substrate is dissolved. The second capillary, which acts as a pump, turns the dissolved aerosols into ions by electrospray ionization that are then analyzed in a LTQ-Orbitrap high-resolution mass spectrometer. "It's a different way of doing things," said Dr. Julia Laskin, a physical chemist at PNNL. "It is sensitive, easy to use, and robust." The utility of the new technique has been tested using aerosol samples from a number of laboratory and field studies. The lab samples were of the ozone-induced formation of aerosol from a limonene precursor and those emitted from burning of ponderosa pine trees. In addition, field samples of organic aerosols collected in Mexico City during the MILAGRO campaign were analyzed. "In all cases, nanoDESI used less sample, required less time, and provided outstanding results," said Dr. Alexander Laskin, an atmospheric aerosol chemist at PNNL. What's next? The team is looking forward to applying the nanoDESI technique for analysis of complex organic aerosols pertinent to laboratory studies of atmospheric and occupational environments. Acknowledgments: The DOE's Office of Basic Energy Sciences, Biological and Environmental Research, and the intramural research and development program at EMSL, a national scientific user facility, funded this research. The nanoDESI is located in EMSL. The capability is available to users through EMSL's proposal process. This research was done by Dr. Patrick Roach, Dr. Julia Laskin, and Dr. Alexander Laskin of PNNL. Reference: Roach PJ, J Laskin, and A Laskin. 2010. "Molecular Characterization of Organic Aerosols Using Nanospray-Desorption/Electrospray Ionization-Mass Spectrometry." Analytical Chemistry. 82(19):7979-7986. DOI: 10.1021/ac101449.